This brief diagram and explanation explains, crudely, how to caculate temperatures, maximum powers and/or heatsinking requirements for a typical labby style laser setup. The diagram above is a diagram of the typical situation found in a labby style, or even portable, laser. 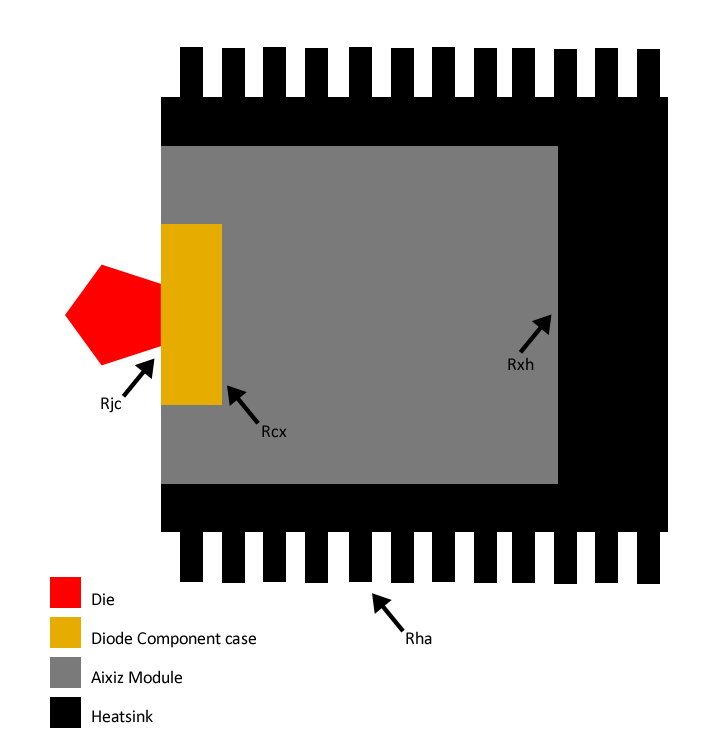 It is based on a system where a laser diode is inserted in an aixiz module, and the module is inserted into a heatsink. The situation for green 532 nm DPSS lasers is often very similar, since the pump diode is mounted into a 12mm housing that resembles the aixiz module, and that is inserted into some heatsink - calculations posted here also apply to that situation. The diagram displays several thermal resistances, which are added up just like you would add up resistance values of ordinary resistors in series. The unit used for these resistances is K/W (kelvin per watt), which is very similar to U/I (volts per ampere) or 'ohm' used in electrical resistors. In engineering, the symbol θ (theta) is often used, but for sake of reproducibility i have used R in this tutorial. To do proper calculations, it is important to know all these resistances, or make an educated guess about them. The junction to case thermal resistance is specified in the datasheet for most electronic components, but laser diodes sadly omit this value most of the time. For the typical 5.6mm DVD writer diode values in the order of 5 K/W are cited, but this may vary between laser diodes, and it will probably be different for 405 and 445 nm diodes. Better sources for this information are investigated. If the diode you are working with has a specified value, go with that, if not, lets assume 5 K/W* for now. The resistance of things junction depends on numerous factors, such as use of thermal paste, but also how deep the diode is pressed in the module, and how snug the fit actually is. The downside of this is that it is hard to determine a practical value. For a very good, metal-on-metal fit with just the right amount of thermal paste, a figure of 1 K/W* would be typical. This can how ever be much larger if your fit isn't snug or you omit any heat transfer paste. This too depends on the exact mechnical design, thermal conductive compounds used, and such. However, the contact area between the aixiz module and the heatsink is relatively large, so this is not as critical. Assuming you have enough contact pressure (using either a snug fit or tightened set screw) and some thermal paste, this can be assumed to be 1 K/W* or less. This is a very important aspect of any practical build, since this is the only thermal resistance you can truly control by choosing the proper heatsink. If you buy a heatsink, this value must be specified. To give a rough idea: a 2 inch tall TO-220 heatsink with fins on both sides standing upright on a circuit board has a thermal resistance to ambient of about 5 K/W. The whole heatsink measures roughly 2x2x1 inch. A ridged/finned cylindrical heatsink of 1 inch diameter and 1 inch length would have a thermal resistance in the order of 20 K/W, details depend on manufacturer and exact construction. At this point, you may wonder what all these details on thermal resistances are actually about. The fact of the matter is you need to know them to determine what temperature a laser diode will get in a particular heatsink, or what the maximum permissible dissipation is in a given heatsink or host. This means that all the thermal resistances listed above can be added to provide a single value, the thermal resistance from junction (laser diode die) to ambient. After that, the only factors to consider are maximum junction temperature, and maximum ambient temperature expected. The result of this calculation is 25 + 1 * 27 = 52 degrees Celcius. Most laser diodes are rated to operate at full power up to a junction temperature of about 60 or 70 degrees, so in this case the heatsinking would be adequate for continous operation. In practical situations, the question is often: "how big does my heatsink need to be for this application to work". Lets assume you wish to operate a 1 watt (optical) 445 nm diode continously. To give an output power of 1 watt, the diode would require in the order of 1 ampere at 5 volts, or 5 watts. This results in a minimal heatsinking requiredment of 8.1 K/W. A suitable heatsink would be a well finned type of roughly 2 cubic inches, or a somewhat larger one with simple fins machined on it. A 'block' type module with only small fins sized at roughly 1.5x1.5x.2.5 inches would likely be adequate, but only just so. Allowing fo some margin of error, a recommended heatsink would be 2x2x3 inches in size with some fins machined on its surface. When shopping around online, a suitable heatsink for this application could be this Z-bolt** one, although its acutally on the small side for safe continous operation! * Some values in this tutorial are estimates. If better information becomes available, i will be happy to incorporate them in this page. Results are not guaranteed and 'your mileage may vary'. ** This heatsink is is shown as an example only, I am not related to Z-Bolt in any way.